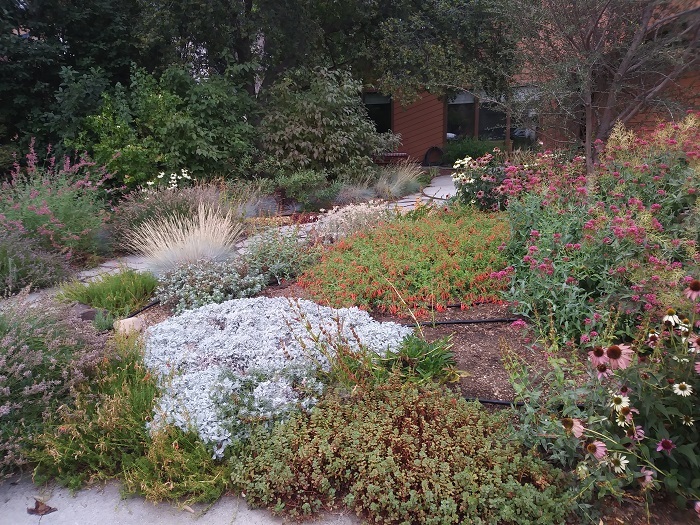 By mid-August some gardens can look dry and exhausted. But a properly descigned xerixcape, like this one, can still be vibrant and exciting after six weeks of searing heat. Here we find a mix of late-flowering perennials like Hummingbird Trumpet (Zauschneria), Hummingbird Mint (Agastache) and Coneflower (Echinacea)–along with evergreen groundcovers like Partridge Feather (Tanacetum densum) and Sedums. Earlier flowering perennials–which made this garden sparkle in May and June–are still there, but are now inconspicuous. This is a great example of a true 4-season landscape.